Since we're starting with the comics, there probably won't be any knocker-to-face transitions to comment on. Comics would be especially good at no "intermediate process of change" simply by showing the knocker in one panel and Marley's face in the next. To contradict Dickens with an actual transformation would take multiple, precious panels. Classics Illustrated doesn't even show the two different looks of the knocker. The first time we see it, it's already got Marley's face. Although in the next panel, the face is gone again. There's no mention of the hearse or the width of the stairs. And the one panel that shows Scrooge's ascent is angled so that we don't really get a good look at the stairs at all. 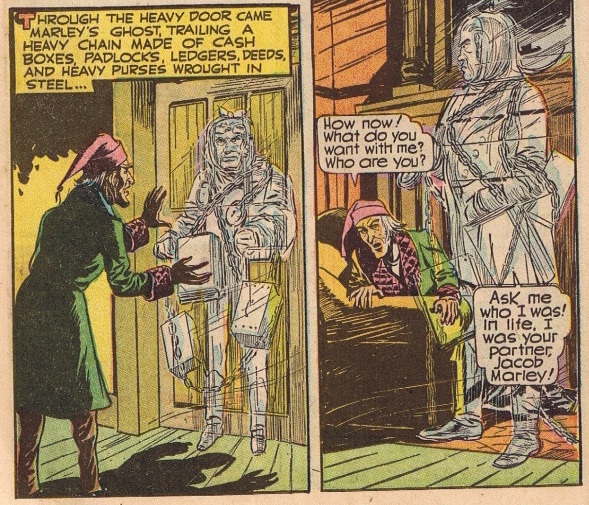 But once Scrooge is upstairs, the comic does treat us a few panels of his checking out his rooms; even the "suspicious attitude" of his dressing gown. His fireplace has no Dutch tiles, much less images of Marley inhabiting them, but Scrooge does still dwell on Marley's face as he eats his gruel (which a helpful caption box explains is "boiled cereal"). Scrooge gets up and paces a bit, restless in his fright. I like how this version builds suspense with Marley's journey upstairs. As in Dickens, Scrooge hears sounds from the lowest levels of the house. One caption mentions that the clanking is coming from "deep down below," suggesting Hell as much as the cellar. But there's also a panel that shows the cellar (this one stores coal, not wine as in Dickens) with a couple of mice watching lines that represent either mist or the passing of some unseen being. There's a nice feeling of dread, especially considering how abbreviated this version is in other areas. Marley moves into Scrooge's sitting room through the locked door and there's even a panel of him halfway through like Kitty Pride. Marley is colorless and see-through. Since the images are static, there's no personal wind or atmosphere around him that we can see, so we'll skip that for the comics. When he pulls off his bandage, his mouth does open to a natural degree. Scrooge explains that he doubts his senses, but there's no humor in it. Even the gravy/grave pun is gone. All the dialogue is heavily abridged and there's even a panel with nothing but text that sums up the conversation. At the end, Marley schedules the coming ghosts as in Dickens: over a span of three nights. Marley flies out through the window and Scrooge sees other phantoms, "many of whom had been known to Scrooge in their lives - all misers," but none of them are trying to help anyone else. The implication is simply that Scrooge is destined to become a ghost if he doesn't change. The comic doesn't sell the helplessness of that situation; turning into a phantom is supposed to be scary enough. And that fits this portrayal of Scrooge so far. As we noticed earlier, this Scrooge isn't actually miserable. He's just a mean, proud man who seems to resent getting old. Which makes Marley a reminder of Scrooge's mortality. Marley's visit shakes Scrooge, but there's no sign yet that Scrooge is ready to change anything. He sees the coming ghosts as something scary and unpleasant to be mandatorily endured, not as an opportunity to learn anything.